14th February 2015: Games2win (“G2W”), a global casual games Company with 50+ million mobile game downloads, announced a licensing deal with Yash Raj Films Licensing (“YRFL”), the licensing division of Yash Raj Films (“YRF”), India’s leading film studio. As the first step in developing a casual gaming domain under YRFL, Games2Win will be creating a set of 5 games based on YRF iconic Bollywood content. 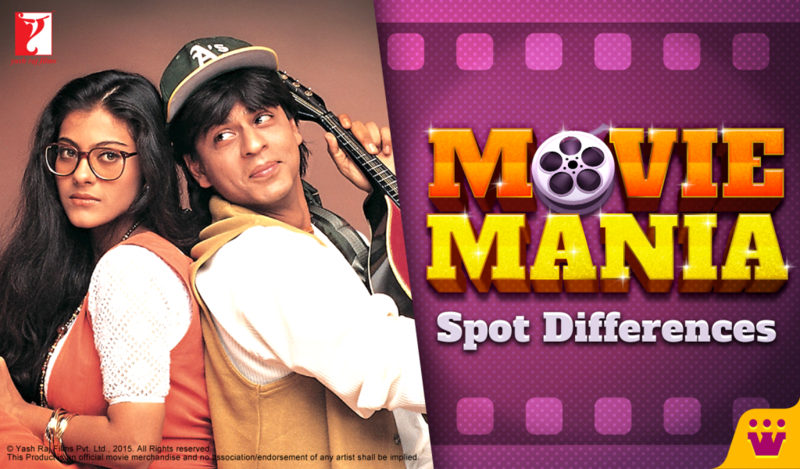 The first game under this non-exclusive licensing agreement is called “Movie Mania – Spot Differences” and is based on YRF’s timeless mega hit Dilwale Dulhania Le Jayenge (DDLJ). The free game just released on the Google Play Store to coincide with Valentine’s Day! The second game is based on YRF’s next major release Detective Byomkesh Bakshy! Alok Kejriwal – CEO and Co-Founder of Games2win explained, “YRF is the most iconic of all Bollywood studios. Their movies are immortal, loved and celebrated worldwide. As global leaders in gaming, we want to marry their content with our game expertise and create exciting casual games that everyone will love to play. The games G2W will create under this extraordinary collaboration will consist of both new YRF films and titles derived from their gold plated catalogue of movies such as DDLJ, Ek Tha Tiger, Chak De India and many more. Our YRF inspired games will be matched with G2W’s best-suited game engines creating a variety of games that audiences will appreciate and love to play. The game we are creating for the film Detective Byomkesh Bakshy, will be an amazing Detective Game that is based on encountering hidden objects situated throughout the game, a game format that is extremely popular globally. For DDLJ, the game design will be one that can be enjoy by all family members. As a business, G2W believes that the future of entertainment is digital engagement, which will be achieved through the combination of popular films and addictive game play. One of the biggest privately owned Studios in India – Yash Raj Films (YRF). In the last four decades, YRF has grown from strength to strength and is the country’s premier independent Studio conglomerate. The company’s core lies in the production and distribution of some of the industry’s top grossing films and today has India’s most enviable film catalogue. With offices in New York, London, and Dubai, YRF handles its own global distribution of films. YRF has its own state-of-the-art fully integrated Studio. It has recently forayed into the International space with YRF Entertainment. The company has its own music and home entertainment labels, design cell and post-production facilities, marketing, digital, licensing, merchandising and talent management divisions, as well as in-house units focused on the creation of television software, ad films and music videos. YRF is an integral part of the entertainment business in India.